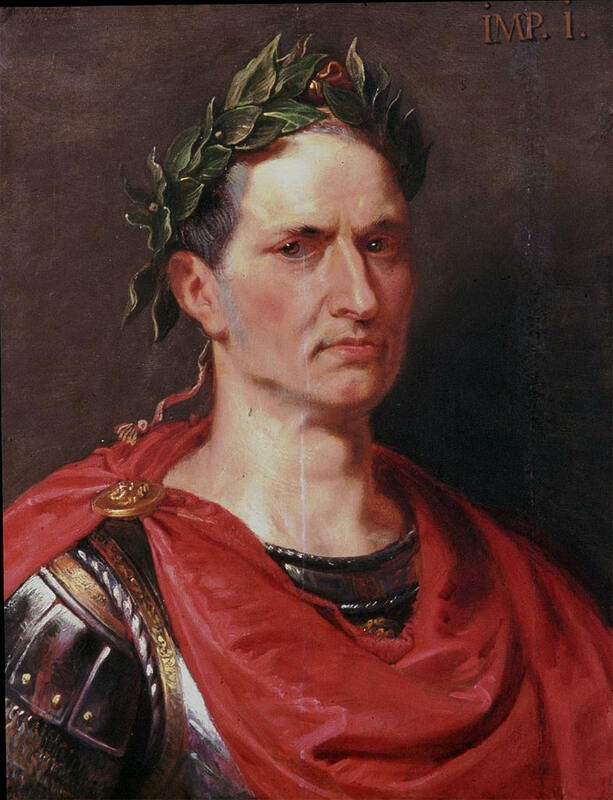 OH JULIUS, YOU WERE A BUSY MAN ! Orange Julius was not the only productive entity of that name. Anyone who had much access to places like malls probably became familiar with the orange drink whose outlets sprang up all over the place starting in the 1970's. 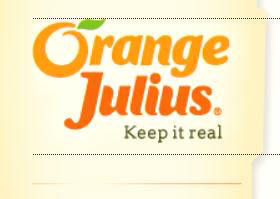 The Orange Julius, along with Julius Caesar, was the about the only place you heard much of that name. However, if you were a fan at C. J. Richards' Fairmont Speedway, when he re – opened the old former fairgrounds horse track in 1962, you probably got familiar with another Julius. To access the speedway grounds, you had to turn off US Route 4 in Fair Haven, and onto Cedar Street briefly. Then, as you took a right onto Academy Street, a house sat right near that intersection. A lot of people know it from Hazel's gift shop. Hazel's husband was a man named Julius Metsyan. 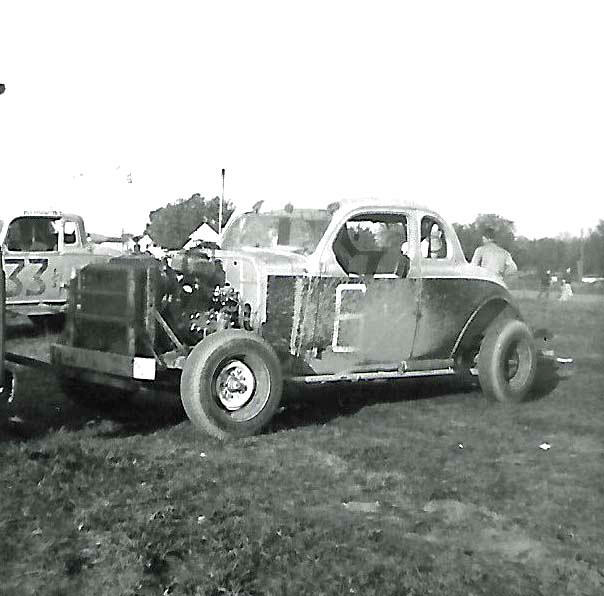 Right when the track opened, Julius constructed a stock car for Hazel's son, Kenny Martin – a skinny kid who hardly looked old enough to be driving anywhere. 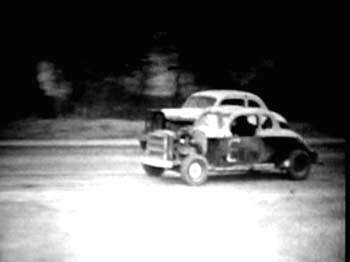 The big, black and silver '40 Ford was numbered 6 and had “The Kid” lettered on the side. Quenneville, Sr . He's in front of Vince's 00. When the racing programs began on Memorial Day, 1962, I do believe the quality of competition might have proven to be a little stiffer than the Mestyan team had envisioned. Kenny drove a few times and then, suddenly, a veteran of races at that same track from the very early 1950's emerged as the car's driver for a while. 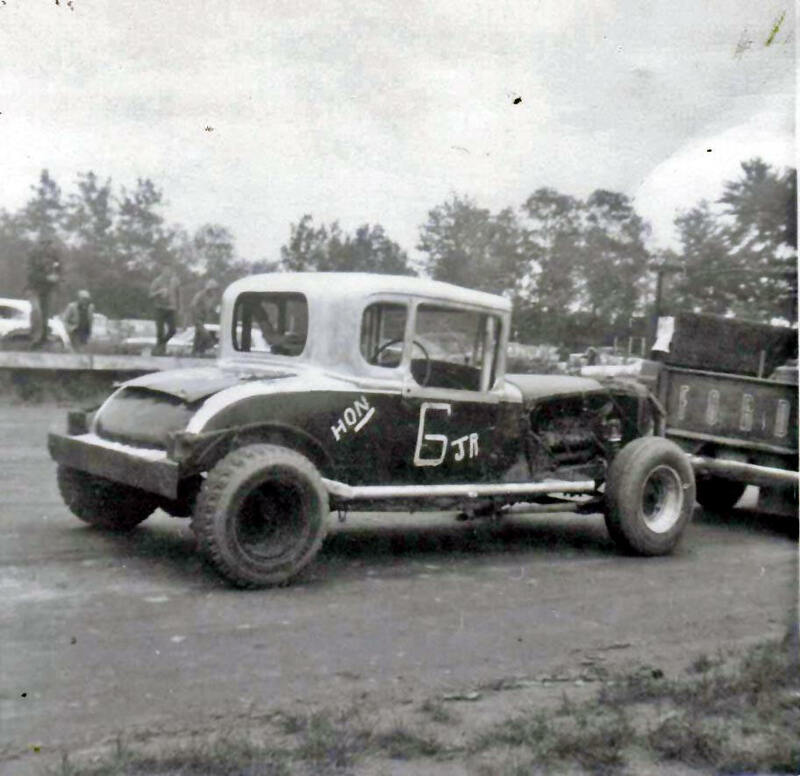 Gene Tetreault, a Manchester Depot, Vermont welder, had driven race cars since they had briefly staged races at the old Manchester fairgrounds in the lete 1940's. The strange old track had normal enough – looking turns one and two; but, the track then came down to what was a very sharp, small turn that comprised the rest of the circuit. It was almost like a psychotic tiny version of Pocono. At any rate, promoter Fucci soon terminated the programs right after a mechanic from Holyoke, MA [probably working for Rene Charland] was killed during a race. speed in turn 2, eleven years later on the same track. 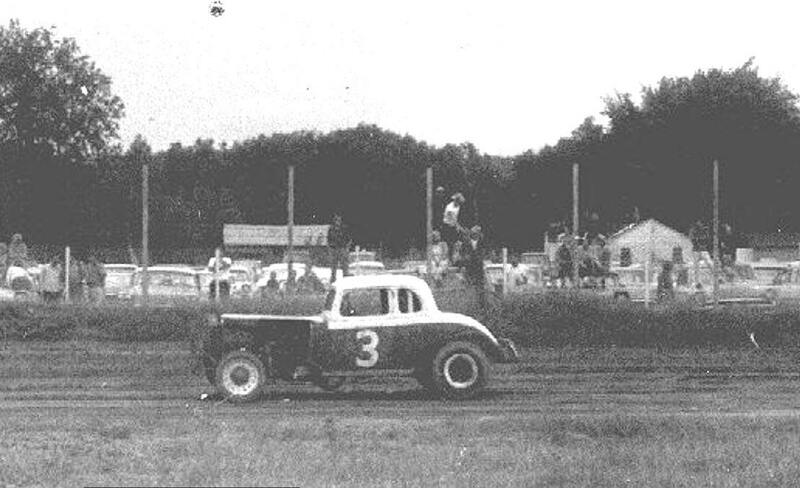 Martin did appear in the car, from time to time, including some races at Otter Creek Speedway in Waltham, near Vergennes, VT. It was a heavy, ungainly car and a handful for any driver. A Rutland Herald article states Tetreault wrecked the car, and it stated this in an article about the opening race of the year. Seeing as Kenny is seen in this car later that year, apparently it was not as totally destroyed as the article suggests. At any rate, by the end of the 1962 season, Julius Mestyan and his racing enterprises were having to do some regrouping. stable, although it didn't perform particularly exceptionally. Below – Charlie McMahan with the same car in 1964. You always expected to see Julius at work on some car as you turned the corner to go over to Fairmont. Sometimes, he was just racing the flathead motor on a car he had already fielded; sometimes, you could see where another one was being put together. I have no resources to ask about whether Mestyan did all his own welding and building or whether there was some guy in the background who was doing some of the heavy lifting. I'm sure Kenny Martin did what he could in the operation. It was quite an operation to observe, and I found myself, at age 14, fascinated by this sight every week. Hazel Mestyan, a tall, thin rough – looking woman with long unruly hair, would drive their beatup car into a parking area to the north of the stands, right by the turn one fence. She and numerous others would clamber onto the understandably – dented roof and proceed to offer strong vocal support [often in very colorful terms] to Gene, Kenny, or one of the other drivers. It looked like a kind of a rough bunch, frankly. reprised "The Kid" on that one. Julius, a smaller but strong man always dressed in work clothes, or Kenny would sometimes go over to their rooting section and yell back and forth with the assemblage busy denting the roof of the old Ford sedan. Like I said, quite a thing to watch. 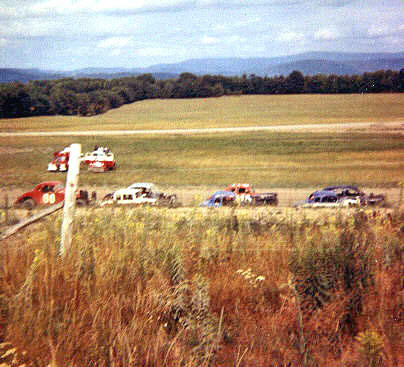 The stock cars, I bet, were simply driven the few hundred feet from headquarters to the track entrance. 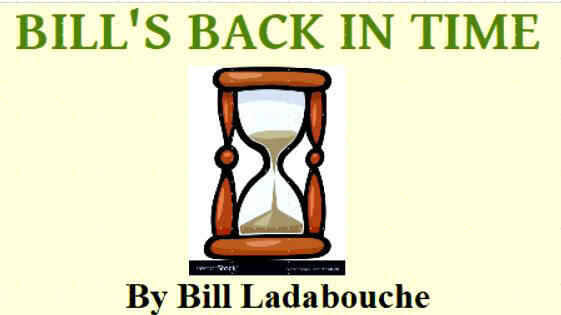 It was probably one of the many reasons that the municipality of Fair Haven fell out of love with the racing soon into its five year life span. At any rate, sometime after the first '40 Ford was first wrecked, Julius had slapped together what looked more like a 1941 Ford coupe for Kenny Martin. Kenny would drive this, on and off for a couple of seasons. It was another pretty heavy car, no doubt safe enough for a driver who may not have all the developed skills of someone like Tetreault. Around 1964, the car ended up being sold off to Rutland's Charlie McMahan. I got to letter it as J2, and he raced it a bit that year. The following year, Fairmont went to the overhead V-8's and McMahan bought a better car. to have outperformed many of the other Mestyan cars. Below – This shot affirms that not all Julius' cars were driven to the track. The remainder of the Mestyan creations came along in such rapid progression that I cannot, in good faith, say that I can describe them in chronological order. Certainly early in the 1963 season, Mestyan came out with the #6 ½. This was a smaller car than his first two – likely a 1936 or 37 Ford. A far as I know, Martin did not get involved with this car. 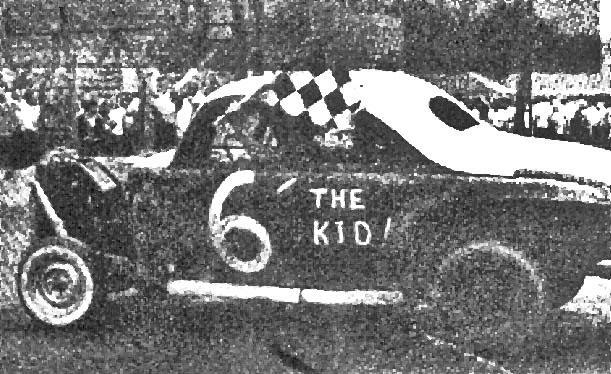 One Fairmont program from around 1963 states that this car was run by one John Quenneville, a distant cousin of the more famous Vince Quenneville, Sr. I had seen John Quenneville at Otter Creek Speedway well before his more famous cousin raced there. John was driving a black and yellow Hudson called “Checkmate”, which belonged to Phil Russell of Sudbury, VT. Russell, quite an engineering genius, eventually would have two of the Hudsons and is said to have the roll cage designed to he unbolted from one body and put into the other. Probably that is true, as I never saw both Hudsons at the same show. Russell would later drive his own cars [aggressively] and John Q would disappear for a while. to the right, out of the picture. John Quenneville's time in the Mestyan car was apparently brief; I don't really recall it and I have a memory like an elephant for that sort of thing. One newspaper article suggest he was involved in a wreck with another driver – likely in that car. The other driver who spent more time in the 6 ½ was Skip Wilcox, a veteran driver hailing from Whitehall, NY [when ot in Trenton, NJ]. 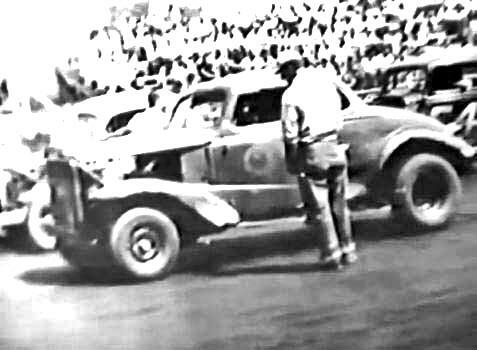 The Whitehall gang was an eclectic bunch of older and younger drivers such as Wilcox, Ken “Pappy” Delong, Larry Jones, Bob LaBarge, and Sonny Greenwood. They jumped in and out of cars about the same way kids change seats during musical chairs games. At any rate, Wilcox drove the black and silver 6 ½ during the 1963 for a while. Results from those days are sketchy, and I don't see his name pop up much in Rutland Herald articles about Fairmont results. One article did state that Wilcox won a heat with the car and mentioned Mestyan as the owner. 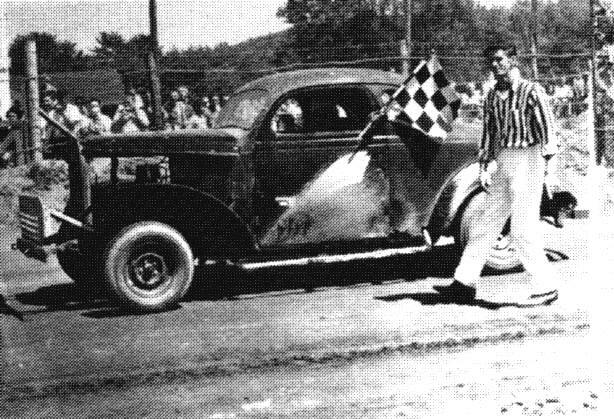 Another article states Wilcox won a heat, and so did the aforementioned Phil Russell, now driving his own Hudson all the time. After the 1963 season, not much was seen of the car; it may have been sold and repainted. lettered X] with Don Ballantine. Another Mestyan creation came out of the shop in 1963. This one was a small pre – 1935 Ford flat top coupe like so many of the NH cars dominating racing at the track in the early years. 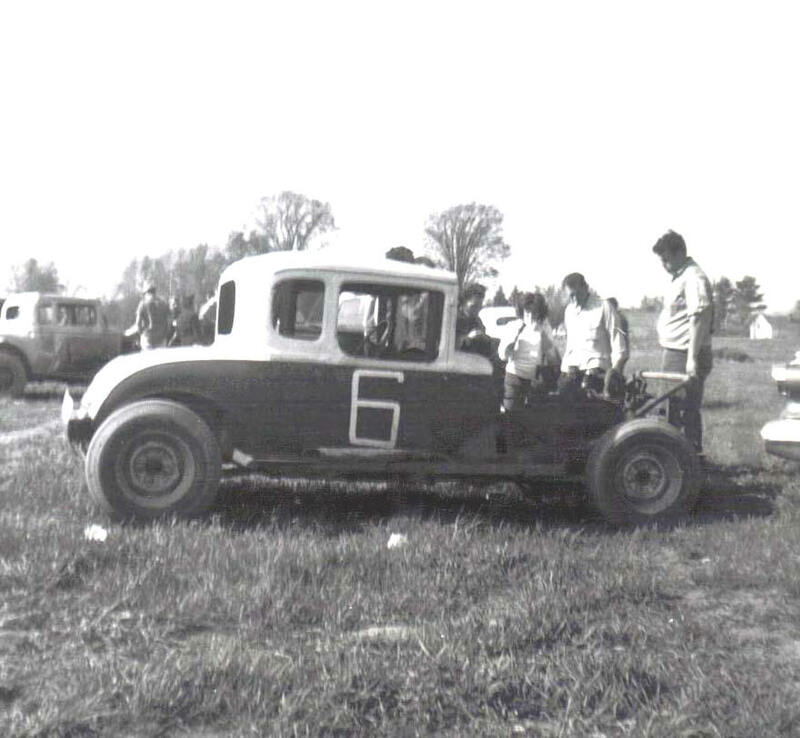 The 6 Jr. may or may not have been the same car as one that has also been photographed as just #6 with the name “Hon” on the side. Apparently with increasing pressure from the unhappy town fathers, Mestyan was now stiff hitching his coupes down the street to the track. The 6Jr photo shows that the car was a 1934 Ford, with the body set on a frame such that it really did not reach the rear ends of that frame. Nothing much is known of the car as 6Jr. It is mentioned in the 1964 program as being driven by Skip Wilcox, with Kenny Martin still listed as driving #6. There are no records of Wilcox doing much with the car and – eventually – loses the “Jr.” and the “Hon” and becomes the #6, plain and simple, for Poultney's John Luleck. By this time, Martin's 6 had gone to McMahan, so the number was open on the team. Skip Wilcox, at speed in the Fairmont turn 2 with the 6 ½. Below – Wilcox vies with the Al Rodd 536 for position. This might suggest the car was actually built in 1962. Luleck would apparently run the car as #6 for Mestyan for a while. 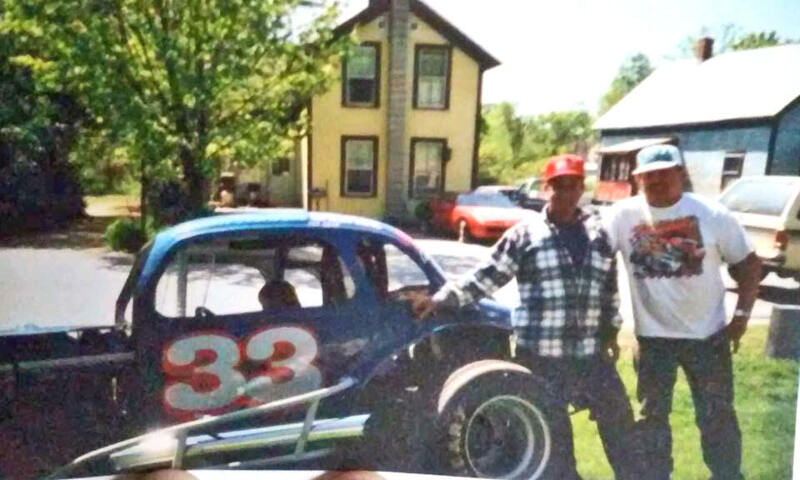 Later, a photo shows Luleck, standing with Don Ballantine [ a sometimes area driver] beside a car X which looks remarkably like the original 6 Jr. Hon car. It is just not clear whether the Julius Mestyan stock car mill spit out four, five, or even more cars in that frenzied period from 1962 to 1964. It is obvious, as Fairmont cars became more sophisticated and went to the overhead V-8 motors, it was just a little too rich for the Mestyan budget. The team had disappeared by the end of 1964. With Kenny not racing, I doubt if Hazel was even interested any more. She continued to run her gift shop in Fair Haven for decades. I have no idea what happened to Julius Mestyan. Kenny Martin, who displayed a real knack for working with horses, did just that until his passing around 2011. Every track, especially in the old days, had a Julius Mestyan who pumped out numerous cars. 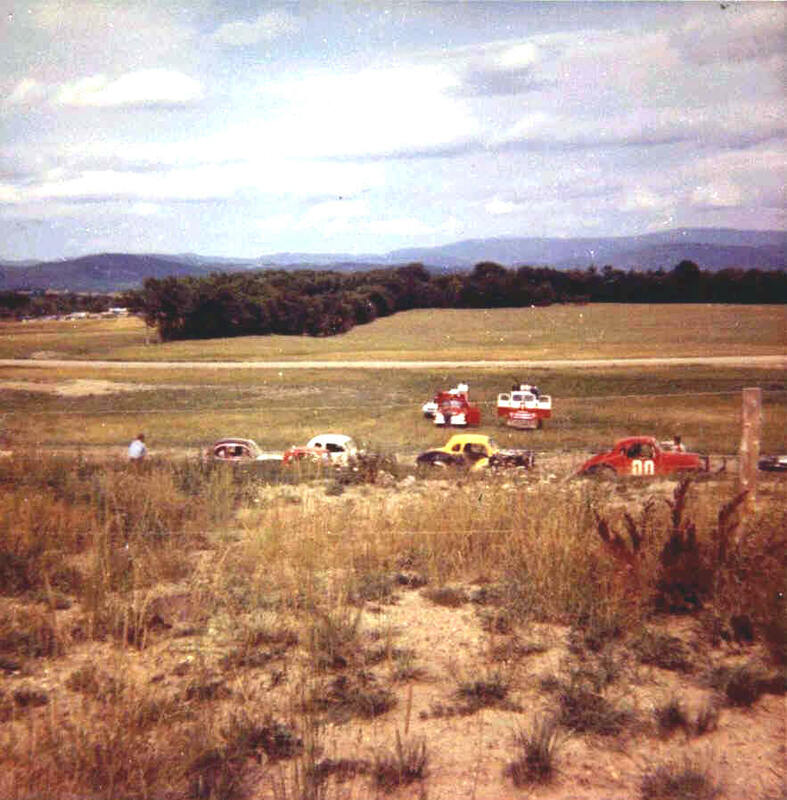 In the early 1950's, it was rambunctious Winooski used car dealer Ivanhoe Smith [who also had his own race track]; at Catamount Tom Tiller fielded a bunch of very competitive late models when Northern NASCAR first went that route I the early 1970's; and I am sure people could contact with numerous other names at numerous other venues. whether he had driven again later in life. The thing is, with homemade cars with junkyard components, racing was definitely more attainable and so was fun doing it. We must not forget the Julius Mestyans of the world.